Rotherham United boss Paul Warne says out-of-favour players could be allowed to leave in January if they do not want to fight for their place. With the Millers nearing a fully-fit squad Warne is likely to have some selection headaches coming up, meaning some of those on the periphery might get even less minutes. Anthony Forde and Matty Palmer are two players that have barely featured recently and Warne, who insists he has no favourites, would be willing to let them move on if they were desperate for game time. He said: “If anyone who is not playing were to come to me and say they didn't think they were getting a fair crack or not getting the opportunities, then I wouldn't want to keep anyone who didn't want to be here. “If Fordey for example didn't play any minutes between now and January and something suitable came up for him then that would be fine, that would be the same for anyone. “I get it that if you're not in the team it's hugely frustrating, especially if you think you are doing everything right. “It is difficult for me, there is no one that I don't like as a person or a footballer but I also understand that I can only pick XI. With the January transfer window closing in, Warne is plotting his recruitment plans and while people leaving on could happen, it is not a necessity in order for him to bring fresh blood in. “I don't like carrying more than five loans, so if we keep all of our loans then the only option we have got is to sign permanent,” he added. “I haven't been told off the chairman that I have to get outs to get ins." 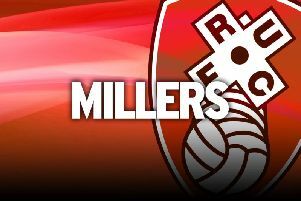 The Millers return to the stronghold of their AESSEAL New York Stadium on Saturday with Swansea the visitors. Warne's men are unbeaten in their last six home games and return to their own soil on the back of consecutive away draws. Defender Billy Jones is fully fit after a recent hamstring injury and is pushing for a recall at right-back while Jon Taylor is also at full speed following knee trouble.